Brands will spend almost $250B on digital advertising in 2018. Here’s where that money goes. Search advertising (those paid listings at the top of search engine results pages) continues to absorb an enormous amount of ad spend. Magna Global pegs total global 2018 digital ad spend at $237B, with $113B of that spend allocated to paid search. Everything else, in Jounce’s terminology, is display. That includes banner ads, video spots, and native formats. It includes ads served on mobile phones, desktop computers, and connected TVs. And it includes ads transacted on the open web as well as ads transacted in closed ecosystems like Facebook. And all of that together is now bigger than search -- $124B in 2018. First, the walled gardens. Six closed ad platforms that control nearly 63% of the display category. 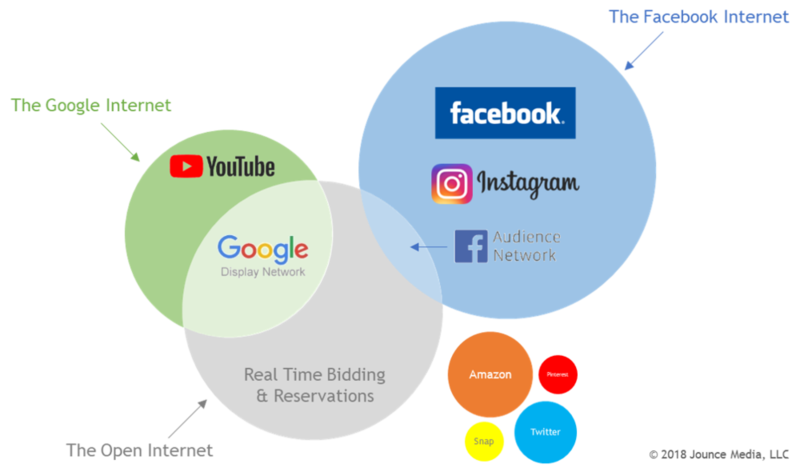 These auction-based environments enable rich targeting and differentiated ad units, but they also impose frustrating restrictions on data portability and measurement. YouTube: Google’s big bet on video advertising, by our estimation, will generate $15.0B of ad revenue in 2018. Amazon: Amazon’s on-site advertising platform is in hyper-growth mode, and we forecast it will generate $4.7B of 2018 revenue. Twitter: Bouncing back from its recent slump, we estimate Twitter will capture $2.5B of ad spend this year. Snapchat: Showing modest growth from 2017, we put Snapchat’s 2018 ad revenue at $1.0B. Pinterest: Starting from a smaller 2017 number, we forecast Pinterest will match Snapchat’s $1.0B of 2018 ad revenue. Google AdWords (soon to be rebranded Google Ads): AdWords is the buying platform for the Google Display Network, and we estimate it will capture $14.9B of 2018 ad spend. DoubleClick Bid Manager (soon to be rebranded Display and Video 360): The enterprise version of AdWords, DBM will manage $2.7B of ad spend in 2018. Facebook Audience Network: While small in comparison to owned-and-operated ad spend, Facebook’s ad network is an open internet power player. We estimate it will manage $4.0B of 2018 ad spend. The Trade Desk: The independent DSP continues to beat public market expectations, and we forecast its 2018 ad spend at $2.0B. Amazon Advertising Platform: Beyond the walls of its owned and operated inventory, Amazon is emerging as a major DSP force. We estimate AAP will capture $1.2B of ad budgets in 2018. MediaMath: The leader among the privately-held DSPs, we estimate MediaMath will manage $1.0B of ad spend in 2018. AppNexus: While primarily focused on its sell-side business, the AppNexus DSP is still a major source of ad spend. 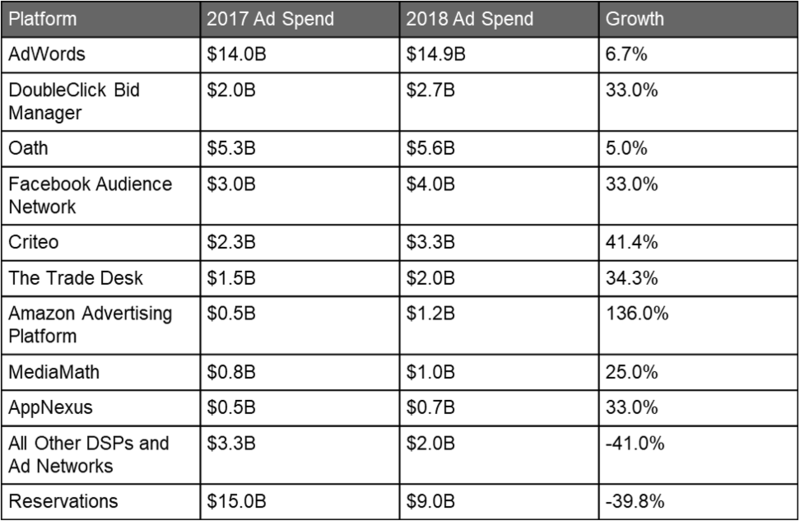 Under current course and speed (and assuming no major repositioning under the new AT&T ad division), we expect the AppNexus DSP will manage $700M of ad spend in 2018. Our math suggests three major shifts in display ad spend. First, we think reservations are collapsing by 40% year over year. This of course isn’t true for every publisher. (Claritin will continue to reserve the allergies page on WebMD.) But many publishers are seeing programmatic become their dominant revenue stream. Second, the walled gardens are capturing the overwhelming majority of ad spend growth. Display advertising will grow by $20B in 2018, and nearly 100% of that growth will be captured by the six walled gardens. Open internet ad buying platforms are operating in a net-zero share shift environment. Third, we think open internet programmatic ad spend is rapidly concentrating among a short list of powerful ad networks and DSPs. Said differently, we think the long tail of subscale buying platforms will see significant contraction in 2018. Some will go out of business, and others will shift their business models to become value added resellers of other DSP technology. Do you think we’re wrong? Do you know we’re wrong? Want to get access to our full set of assumptions and sources? Help us make these numbers more accurate either through the comments section below or by dropping us a line at contact@jouncemedia.com. We’ll continue to update this post with the best available information.